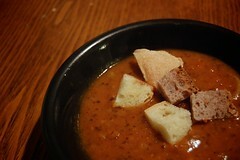 I made black bean pumpkin soup tonight after being inspired by the epicurious recipe here. I somewhat followed it, which means, I took the ingredients list as a suggestion and just added stuff in what I thought were the right quantities. I wasn’t sure what to expect in terms of taste, but the cumin I added in it made the whole soup taste Tex-mex like chili. Next time, I think I’ll back off on the cumin so I can taste a bit more of the sweetness from the pumpkin. 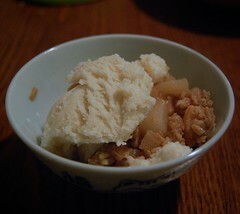 For dessert, I made pear crumble topped with store-bought ice-cream. I cut the pear into bite-sized pieces and sprinkled cinnamon, a spritz of lemon, ginger powder, and all-spice before tossing it around in a baking dish and chucking in the 350 degree oven for 10 minutes. During those 10 minutes, I put together the crumble topping which was: two tablespoons margerine, 1/3 cup rolled oats, a small amount of pastry flour, white sugar (I wanted brown, but we had none), cinnamon, and nutmeg. I just mushed all these ingredients together, put them on top of the pears, and then baked for another 30 minutes or until the topping was crunchy. I was going to put some chopped nuts in the topping, but completely forgot. Despite that omission, the pear crumble was delicious. I liked it with a scoop of soy ice-cream on top because it cut down on the tartness of the pears, but the BF liked it plain because he said the ice-cream overpowered the pears. I’m not really sure what the English name for this restaurant is, but it’s on the corner of Life Plaza. It initially was just a dessert place specializing in Chinese desserts like mango pudding and shaved ice, but now it’s on the hand-shaved (dao xiao) band-wagon. 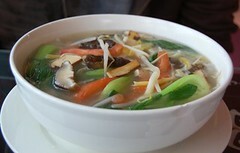 The BF ordered the house special vegetarian noodle soup. The noodles were decent and chewy, but the broth tasted like a boullion cube. It seemed like someone just threw in a bunch of vegetables like bok-choy and tomatoes into a pot of water and powdered vegetable stock. I got the house special beef noodle soup. It was supposed to be spicy, but I couldn’t taste it at all. There was a bit of the Szechuan peppercorn taste, but it was pretty weak. The broth was also lacking in depth. I had to dump a bunch of chili oil and vinegar in it to make it taste better. The beef was surprisingly tasty though and had just the right amount of seasoning. 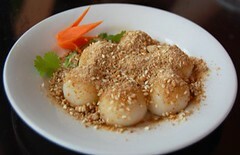 For dessert, we shared the peanut rice-ball which is just glutinous rice balls (like mochi) covered with sweet crushed peanuts. It’s simple, but delicious. I don’t know if it’s because they’ve only started branching out into non-dessert food, but I thought both of our noodle soups were mediocre. Next time, I’ll go somewhere else to get my noodle soup fix and go to Benser for dessert.